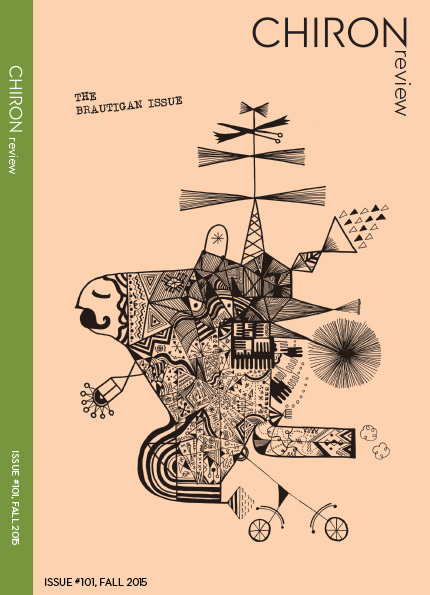 The Brautigan Issue. Unpublished prose by Richard Brautigan, with an introduction by Ianthe Brautigan. Poems by: Jeffrey Alfier, Tobi Alfier, Mark James Andrews, Glen Armstrong, Lisa Bellamy, Brenton Booth, Tom Brzezina, Joan E. Bauer, Chaim ben Avram, Ace Boggess, Joan Colby, Kristofer Collins, Ianthe Brautigan, Richard Brautigan, Alan Catlin, Lucia Cherciu, Tyler Campbell, Chelsea Cefalu, Jefferson Carter, Robert G. Cowser, Robert Cooperman, Carl Miller Daniels, Noah Davis, Nausheen Eusuf, Alexis Rhone Fancher, Mike Faran, Bud Faust, Bill Glose, John Grey, Floyd S. Houston, Mike James, Lowell Jaeger, Anthony Lucero, Ellaraine Lockie, Robert K. Johnson, Curt Last, David Lawrence, Natalie Lauren Morales, Greg Moglia, Matthew David Manning, Leslie Anne Mcilroy, J. Richard McLaughlin, Crawdad Nelson, Ben Newell, Zach Nelson-Lopiccolo, Charlotte F. Otten, Shawnte Orion, Myra Pearson, April Pameticky, Marge Piercy, Charles Rammelkamp, Marilee Richards, Terry Savoie, Chase Spruiell, The Poet Spiel, Marc Swan, Rowena Silver, Mike Spikes, Christine Swanberg, Danny Earl Simmons, William Taylor Jr., Jared Smith, AJ Urquidi, James Valvis, A.D. Winans, Lenore Paula Weiss. Anthony Lucero interviews Lt. Col. Jason Amerine, United States Army Special Forces. Featuring art by Jun Arakawa, including stills from the film Here Is Something Beautiful (etc.. Design by Craig Ashby.